We saw a leaked photo of the new Motorola Moto Z3 Play last month and now we have another one. This new photo gives us a good look at the design of the handset and it confirms some of the features we heard about previously, it was posted on Twitter by Evan Blass. A previous rumor about the handset suggested that the device will feature a 6 inch display with a FHD+ resolution of 2160 x 1080 pixels and the handset will be powreed by a Snapdragon 636 processor and will come with 4GB of RAM. Other specifications on the device will include 64GB of storage and a microSD card slot if you need some extra storage.The handset will come with high end cameras on the front and back. What we know about the cameras is that the front camera will come with 5 megapixels for Selfies and video chat. On the back of the device there will be a dial camera setup, unfortunately we do not have any details on how many megapixels these cameras will come with. The device will have a 3000 mAh battery and will come with Android 8.1 Oreo. 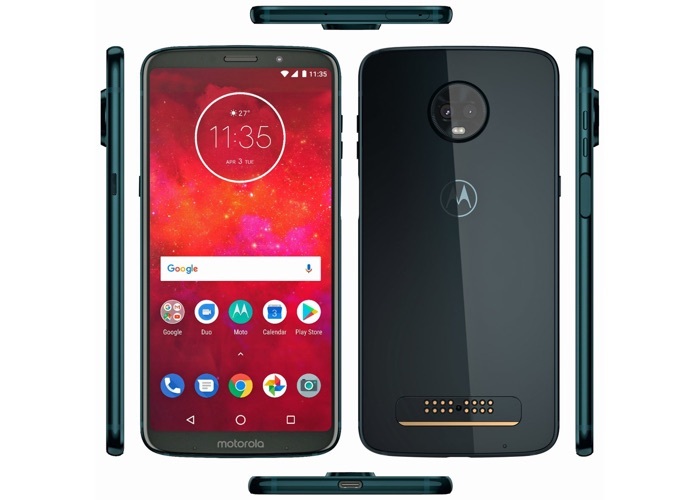 As soon as we get some more details on the new Moto Z3 Play, including some more specifications and details on a launch date, we will let you guys know.